The long-awaited Colony Type GM Command from Mobile Suit Gundam 0080: War in the Pocket joins the Master Grade line! The GM Command's iconic silhouette has been recreated in the newly designed Master Grade standardized form. The kit's frame allows for smooth articulation in the waist, arms, and legs, opening up a wide range of articulation to achieve various poses close to those of the human body. It's iconic, colony version backpack has been replicated utilizing newly designed parts! Set includes Bullpup machine gun, 2x Beam saber, shield, 2x Magazines, 18x Runner, 1x Sticker sheet, 1x Marking sticker sheet, and 1x Instruction manual. 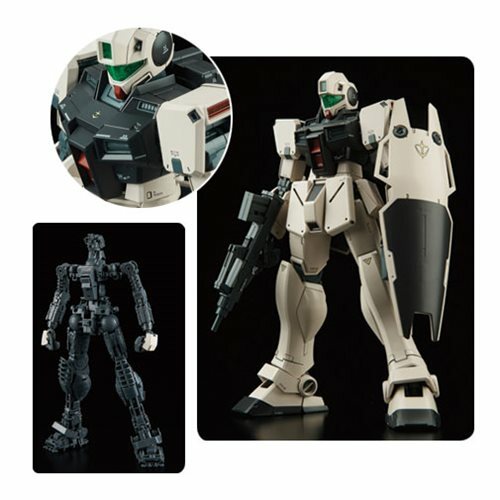 The Gundam 0080 GM Command Colony Type Master Grade 1:100 Scale Model Kit measures about 7-inches tall. Ages 15 and up.